Play your videos on chromecast or Smart TV! 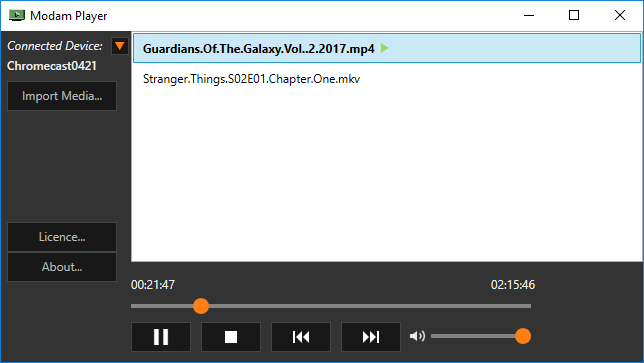 We developed our first software named Modam Player last year (2018) which allows Windows users to cast any videos on your TV. We currently also working on another application that makes it easier to do UI tests for C# applications. This new application is called Modam Tester and more features/news will come for this application this year.. The studio is located in Montreal composed of a small team dedicated on creating feature rich applications. For any comments, please update the form below and we will respond to you as soon as possible. Play all your video files to your Chromecast or a Smart TV! Create your playlist to play all your videos in a loop. Auto-conversion of videos to make sure it's playable by the Chromecast. Currently supported video formats are mkv, mp4 and avi. you can leave your message here. ©2019 - Modam Studios. All rights reserved.